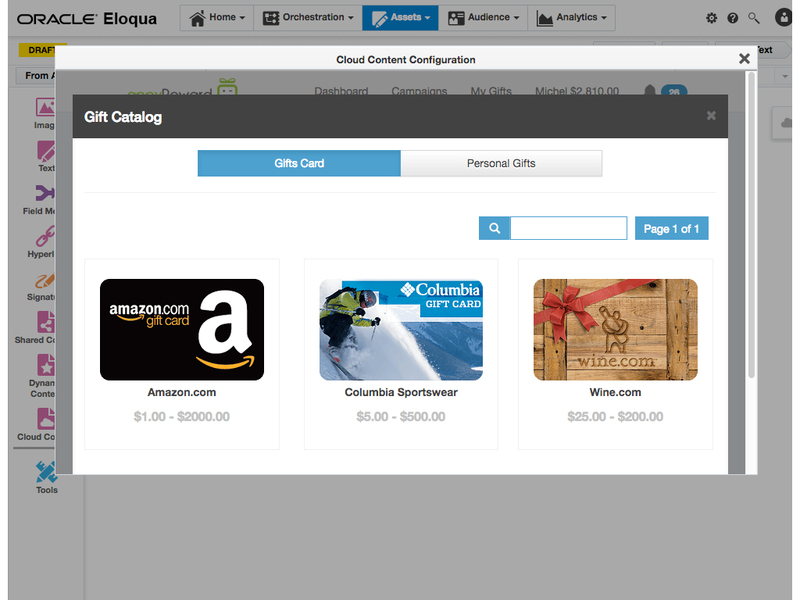 Take the full control of the gifting experience with Oracle Eloqua®! 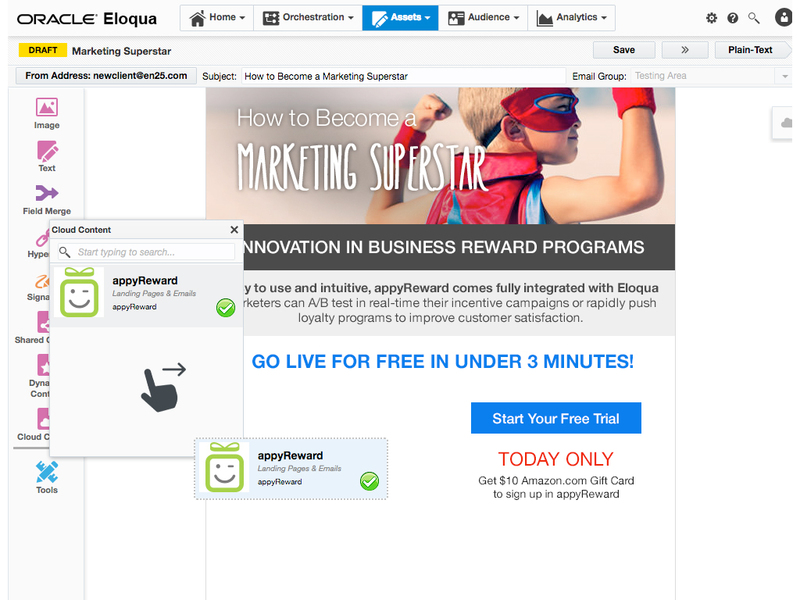 Create High-Converting e-Gift Campaigns with Oracle Eloqua To Better Attract your Prospects, Engage your Leads, and Retain your Loyal Customers. Take the full control of the gifting experience with Oracle Eloqua. Seamlessly drag & drop attractive e-gift cards within your email or landing page. Choose your e-gift from a catalog of more than 200 popular merchants and quickly create high-impact campaigns that improve your conversion rate and engage customers. If nobody likes feeling as a lead, everyone loves being rewarded. Pick your Gift, Fix its Value, Set Quantity Codes, and Drop it within your email or landing page. 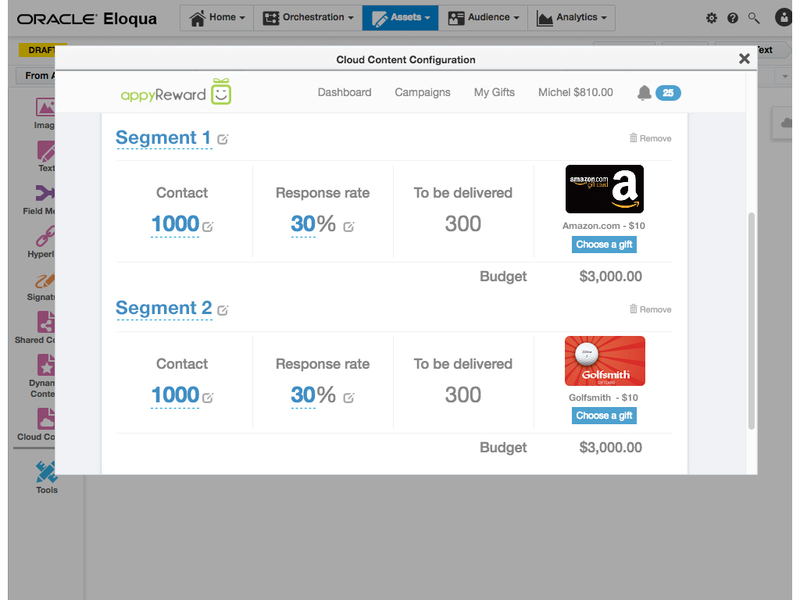 No need for additional lists and segmenting: e-gift campaigns built on the appyReward platform can be configured within your Oracle Eloqua campaign canvas and integrated with your existing automation infrastructure. No minimum quantities – Send in a minute a few e-gifts to any segments first, compare results, and then send thousands with the most appropriate e-gift. Know in real-time the moment your customer redeem your gift, and get credit back for unclaimed gifts. 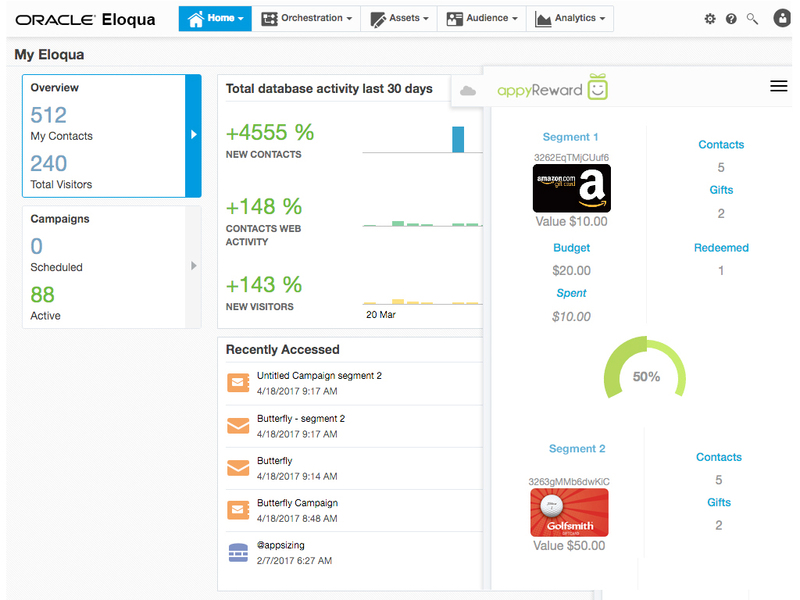 appyReward manages the digital delivery to recipient and reports all results via Eloqua Custom Objects. Share customer details with your sales team by matching e-gift campaign results with your Oracle Sales Cloud CRM or appyReward 1-to-1 Dashboard (free). Seamlessly drag & drop attractive e-gift cards within your email or landing page. Choose your e-gift from a catalog of more than 200 popular merchants. Fix its Value, Set Quantity Codes, and apply your e-gift campaign within your email or landing page. Know in real-time the moment your customer redeem your gift.